This last week teachers were back at school getting ready for students. I spent today uncovering my classroom typewriters and diagnosing any problems that might have crept up from the heavy use last school year. It's a multi-day project and I hope to have all the machines ready for student use before the start of the school year; August 5th. 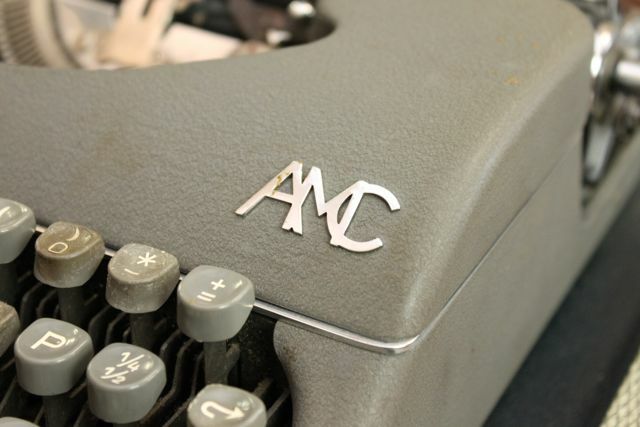 The badge says AMC, but under the stolid grey facade is a French-made Japy. I saw this little machine on eBay for a pittance and thought I would snag it. 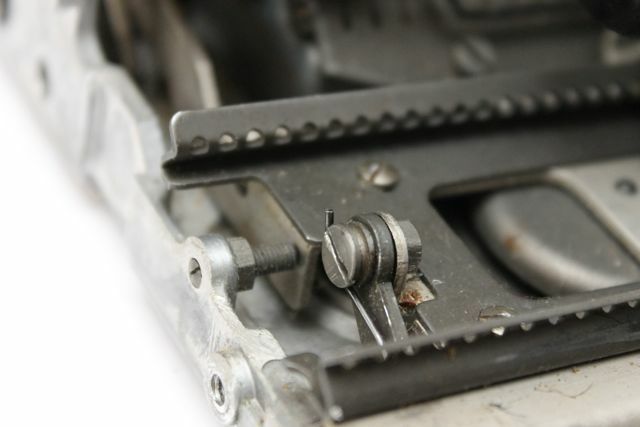 It's in fair condition, but there is something odd going on with some of the key tops. As you can see they look as if they are melting. Melting? Yes, melting. It's hot here, but not that hot. More on that later. I'd never seen a Japy person. In the past I had vague ideas of owning a Script or one of the several other re-branded versions out there. I particularly like the Piccola which was a Swissa version of the licensed pattern from which my AMC is based; all of which come from the Patria. 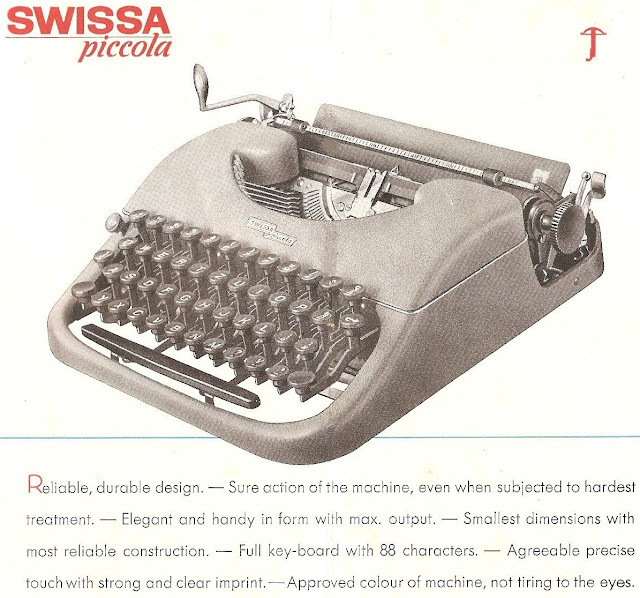 The Patria can best be described as a faimily of typewriters. This design was adopted by several manufacturers across Europe. Japy was one of those manufacturers. Will Davis and Georg Sommeregger have spent considerable time covering the intricacies of the Patria/Swissa/Japy connection here and here. This AMC/Japy arrived poorly packed and when I opened the case I was disheartened at the state of the carriage. It was stuck in a very unnatural position. I had the inkling that a jolt had caused the unsecured carriage to shift and then jump past the uppercase shift stop. 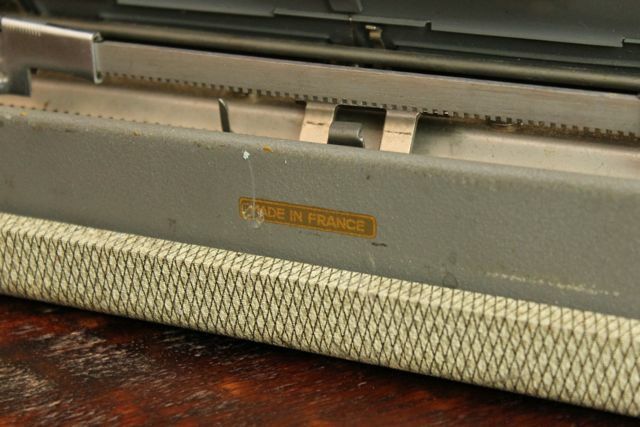 I tried moving one of the type bars up to the printing point and it aligned with the bottom of the platen. Curses! Undaunted, and with some brute force, I was able to push the carriage back down to a position that looked more normal. I then started looking for the shift stops. In short order I found them and saw that the screw and set nut were in an odd position. 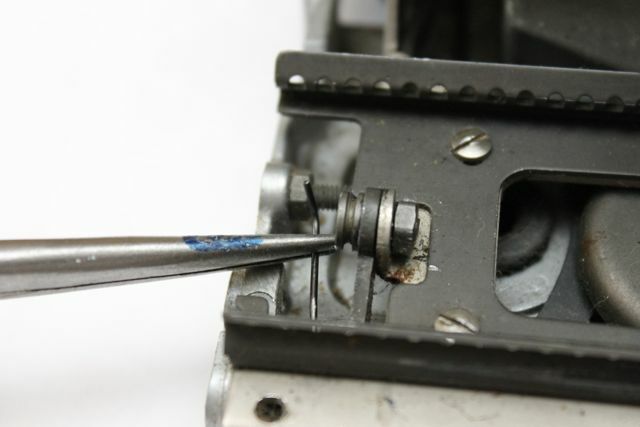 Loosening the set screw, the carriage dropped down to a normal height. When the carriage over-shifted it bumped past this stop and jammed itself. Luckily it was an easy fix but the type was massively out of alignment. 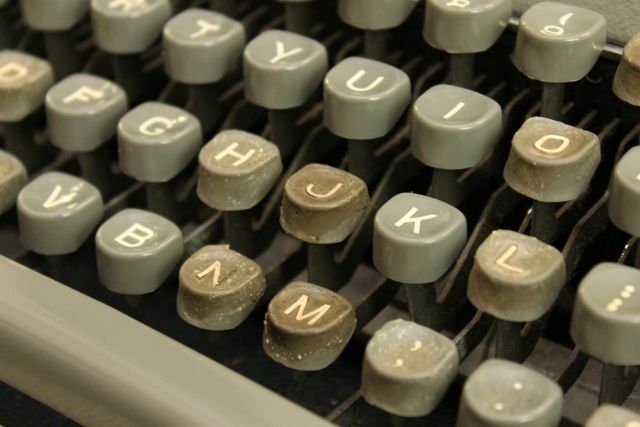 The slow and steady task of dialing in the correct alignment for both uppercase and lowercase type began. Right now it's not perfect, but the carriage is advancing properly, the imprint is more aligned, and it seems as if no lasting damage was done. Having completed the biggest task, I looked toward some smaller problems. While deep inside the machine I noticed two springs that were flapping around freely. You can probably guess that they are part of the carriage shift. 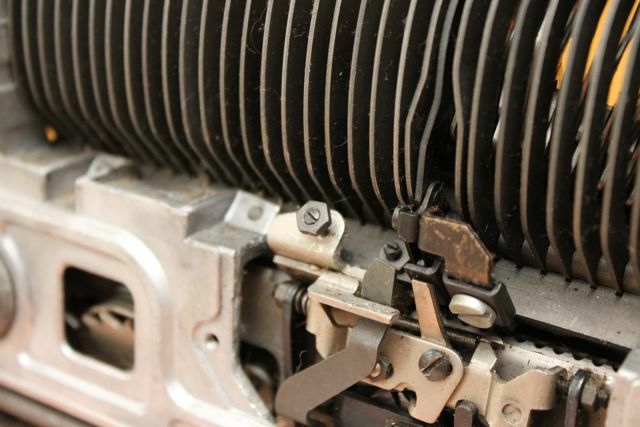 When the shift key is depressed these springs give a little lift to the carriage. Their job is to lighten the load. I had a devil of a time finding where this tail of the spring went until I took this picture. That pivot point looked like it was just the location. 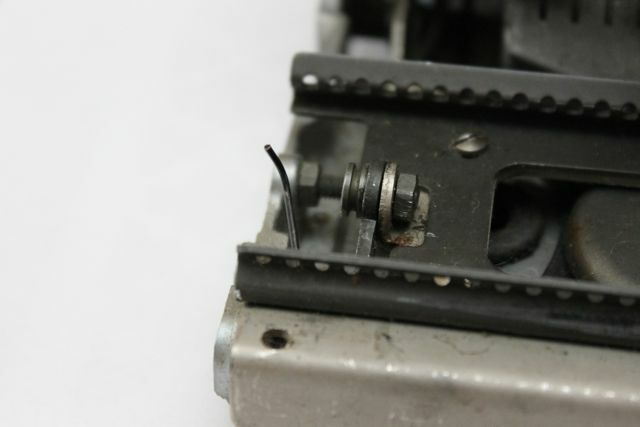 With a quick motion of a needle nose pliers I was able to place it back. You could have knocked me over with a feather when it fit. The carriage was lightened significantly. I would just be worried about it coming undone again. Thinking on it I came to the conclusion that this spring–and its mate on the other side of the carriage–had jostled loose during shipping. The fixes are holding, but what about the keys. Here's the picture again. As to the key tops, that's a mystery. What would cause them to melt like that? The surface is not smooth. They feel rough and the inlaid plastic letters are starting to pop out. Is it be possible that the oils or chemistry of a person's skin could cause plastic to degrade like this? Part of me wants them to look pristine and brand new while a contradictory part wants them to stay just as they are. 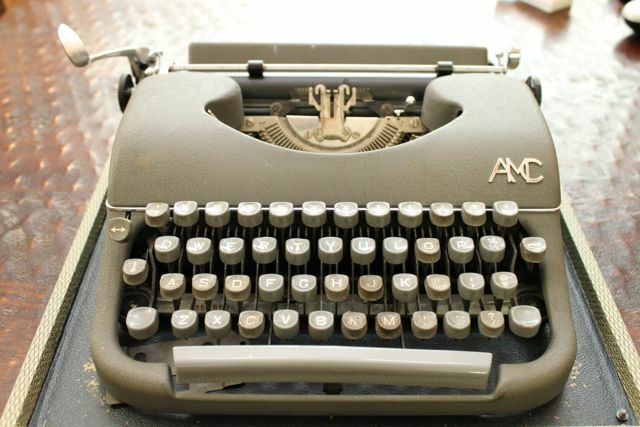 As for dating this typewriter the AMC entry in the Typewriter Database doesn't have a sequence for Japy-made machines. If you look at the Japy numbers this serial falls nicely into the 1957-1958 sequence. Given the date on the back of the instruction booklet (1956) I feel pretty comfortable with the assignation. Apart from the dodgy keys, I really like this little machine. Thankfully the shipping damage din't prove to be permanent. The next step is to clean it up and get it typing. Unfortunately I have quite a backlog here.